This morning I went out for an easy 4 mile run with Ruth before she headed off for an overnight business trip. No bunnies. Maybe some will be there to mark the occasion when she comes back. My toe is still tender, and the area around the toenail has turned an angry red color. It didn’t like being jammed into my running shoe. After my run, I drained the blister under the nail again and I cut the nail back as far as I could so it’s less likely to bump up against things. But enough about the toenail. From past experience I know it’s going to take most of a year to grow back. With any luck, I can ignore it while it does. I’ve been keeping track of my weight at the bottom of every post. It was up a little today, but as long as I stay under 150, I don’t worry too much about the daily fluctuations. Still, I made sure I skipped the (tasty, tasty) muffin when I ordered this afternoon’s coffee. For the longest time I didn’t bother to track of my weight. I went by the belt rule – as long as my belt was still on the same notch I figured I was okay. But when I stepped on the scale after we got back from our vacation in June, it told me I was up to 154. I ate more than usual while we were away but I exercised enough to balance the food, or so I thought, so the number surprised me. I know that as people get older, it gets harder for them to keep their weight down, but that had never applied to me before. If I’m going to run a fast marathon it’s important to keep my weight down, so I started paying a little closer attention. I eat well, or at least I eat better than I did when I was 20 (or even 40) years old. I hardly ever eat a whole bag of Doritos by myself anymore. I eat a lot more vegetables than I used to. I even make salads with so-called “superfoods” like raw kale and beets, which bugs Ruth because she doesn’t like the taste of kale. But I’m still a run-to-eat, not an eat-to-run, kind of guy. I run so I can eat more of the food I enjoy instead of planning my diet around what’s best to fuel my running. I make sure I eat a banana every day to help stave off the leg cramps that I used to get at night, but I like bananas. Food is fun, not just fuel. I’m lucky. If my weight creeps up, it’s usually not too hard to get it back down. I don’t have to go on any fancy diets, which is good because whenever I’ve tried counting calories, I overdo it, and when I go for a run I feel weak, my legs feel rubbery, and running more than a couple of miles is more effort than it’s worth. I have to watch two things in particular. Ruth and I like to go out to eat. Restaurant portions are usually too large, but I was brought up to clean my plate. Besides, if it didn’t taste good, we wouldn’t order it. Then there are the simple carbohydrates. I run a lot, but not enough to match my taste for muffins, cookies, ice cream, doughnuts, chocolate, bagels, and all the other fun, floury, sugary things that taunt me from the shelves of the coffee shop, grocery store, and bakery. But if I battle those dietary sins to a draw, any extra weight drops off soon enough. I really hope that doesn’t change as I get older. But it’s not all about being thin. When I was 35, I weighed around 140. I could regularly run under 20 minutes for a 5K, but I never had much success running marathons. You can see from the picture below that I had no thighs when I was 35. Now I’m up near 150, but if anything I’m a little leaner. I have more muscle in my thighs and my core. The muscle weighs more, and I get chafing in places where I never did before, but it gives me the strength I need to hold up on my long runs. 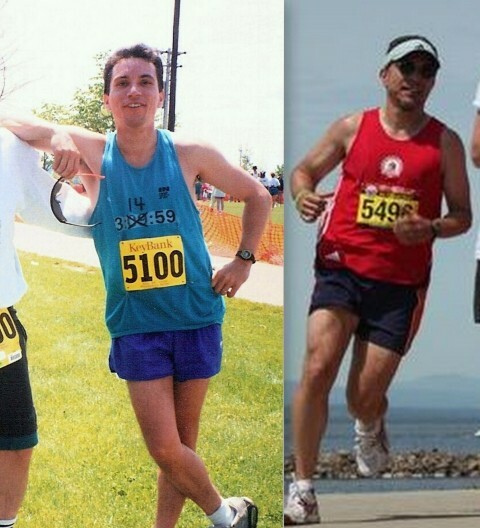 Note the “Boston Qualifying Time” singlet sported by the 35-year-old me. I had to edit it one more time before I finally qualified.